WHY DO THESE CONTAMINANTS NEED TO BE REMOVED? When you are powder coating, these contaminants will travel right through your powder coating gun and onto your part. These contaminants, when heated will cause issues in the final finish, usually in the form of "fisheyes". Fisheyes look like little craters or popped bubbles on the powder coated finish. 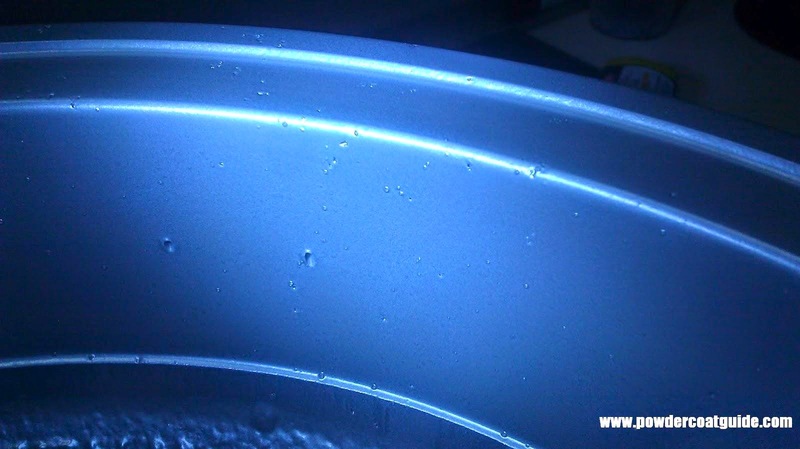 If you look closely at the picture below, you will see this the effect of moisture or oil in the compressed air supply. The same concept applies to auto painting and liquid paints. Water is the enemy of sandblasting. Water will mix with your blasting media and cause it to clump up and clog inside of your sandblasting gun. When the sandblasting gun clogs, the output of the media will be reduced or stop all-together which means you must stop what you are doing, take apart the gun and clear the out the wet media. This is an annoying and time-consuming process. Not to mention that you are blasting your part with wet and oily media which can cause issues when it comes time to powder coat. Even if you are just using your air compressor to run an impact gun, you need to have relatively dry air. Any moisture or water in the air going through your air tool will cause corrosion inside of the tool which eventually cause it to fail. The same issue applies to other air operated machinery such as tire changing machines, plasma cutters, or lifts. You do not want water ruining this expensive equipment, so make sure that you are taking steps to eliminate it from your compressed air supply. WHY IS THERE WATER, OIL, AND DIRT PRESENT IN MY COMPRESSED AIR? Dirt is in present in your air supply because it is present in the environment, and by dirt, I mean any solid particles that are floating around. The air compressor takes in air from around it, compressed it and stores it. 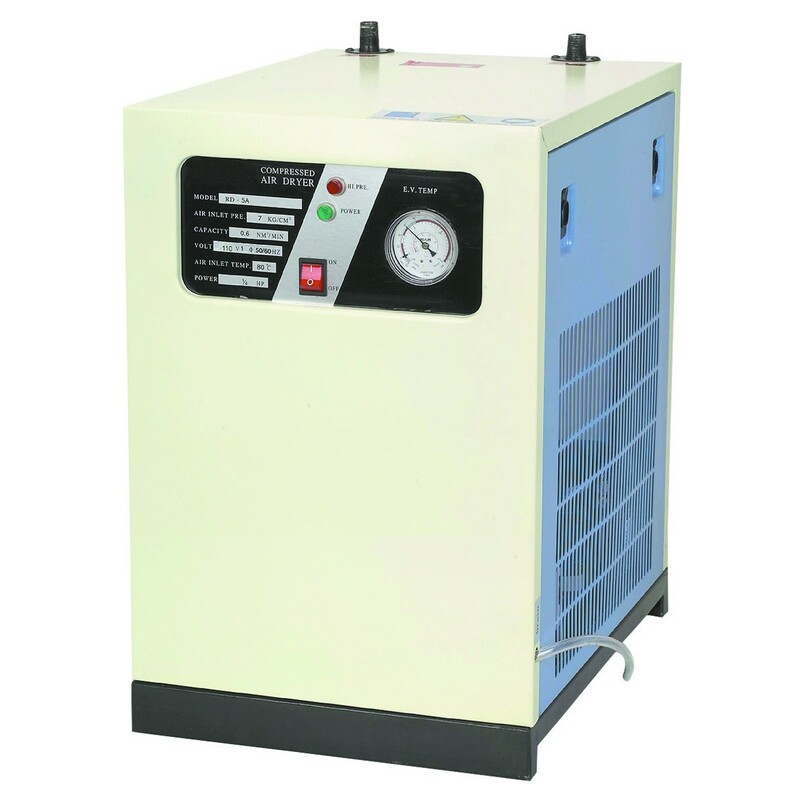 Although there is a filter on the air compressor to stop dirt from entering the air compressor, it is not 100% effective at removing every particle. Oil is present in the air supply because of oil blow-by in your air compressor. Oil-lubricated air compressors have seals to prevent oil from reaching the air, but they, again, are not 100% effective. Water is the big one, it is the most difficult to remove and if you haven't researched it before, it may not make since why it is coming out of your air compressor. Air compressors take in large quantities of air and compact it into a much smaller space. There is always water present in air and depending on what area of the world you live, there will be different amounts of it. This is called Humidity. While looking around your garage, you obviously don't see water floating around, but it is there. Considering your air compressor is storing a room full of air inside of a small tank, that same room full of air's water vapor is going to go into the tank too. This is where the water starts to add up into visible water droplets. If you never drain your air compressor, the water will continuously add up until you have gallons of water sitting inside of your compressor tank. It would seem simple enough, that just draining your compressor tank regularly would remove the water content. Unfortunately, this is not the case. Air compressors heat up the incoming air substantially when they are running. Hot air can hold much more water than cold air can and as you cool the hot air, the water vapor will condense into a liquid. 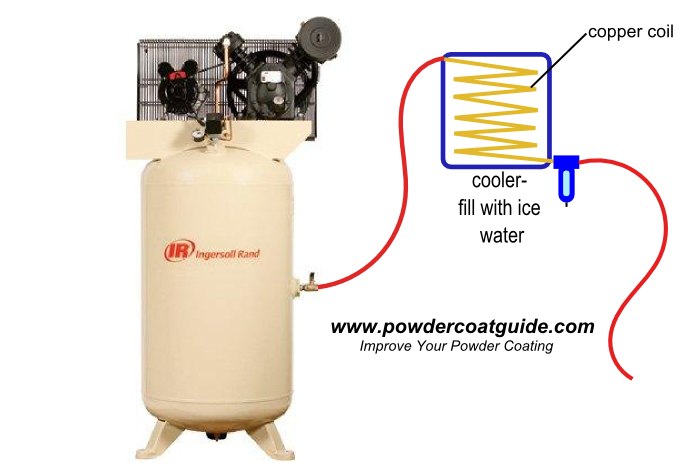 The air stored inside of your tank will be very hot and when you release the air by allowing it to run to an air tool or powder coating gun, it will cool down along the way. This is when the water vapor drops out of the air and turns into a liquid which will then continue on to your tool. The whole idea behind compressed air dryers is to catch this water before it reaches your tool. There are many ways to eliminate these contaminants, ranging from some well thought-up DIY setups to commercial products. I will explain many of these options in this article. Since water is the most difficult to remove, I will cover that first. The whole theory of removing the water revolves around cooling the compressed air to allow the water to drop out and then catch it. All of the following methods work using this theory. The reason why I don't just explain one single method is because of cost. The easiest and most efficient water removal method is also the most expensive. Multiple methods can be and sometimes need to be used on the same setup to achieve dry air. Let's get to the different methods now, I will start with the most effective method first. A refrigerated air dryer is a unit that you plumb your air compressor to that cools the air below its dew point causing the water to drop out of the air, it then separates the water from the air, heats the air back up to room temperature and sends it on its way. If you look inside of one of these units, you will see that it functions very similar to an air conditioning unit. One simple solution to dry air all contained in one unit. It sounds like the perfect answer doesn't it? Why would anyone try to rig up other ways to dry their air if a magical unit like this is available? The answer is COST. These units start at about $700 brand new, and if you manage to find a used one, it won't be that much cheaper as they hold their value very well. 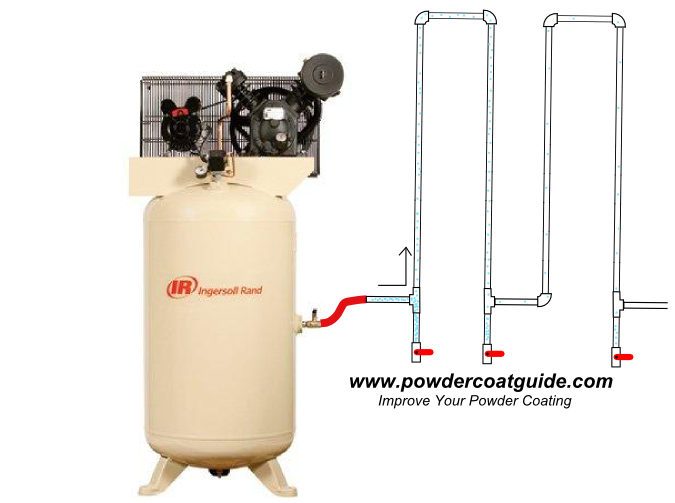 If you do have the budget for it, or you have plan on putting a professional powder coating system in place, look no further than the Refrigerated air dryer as it is the best solution. They are very low-maintenance, the only downside after the initial purchase is that it has to be plugged in to work so it may have a small effect on your electric bill. These units need to be sized according to your compressor. The higher the cfm output of your compressor, the bigger compressed air dryer you will need. 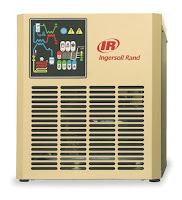 This Ingersoll Rand D25IN model is an entry level, yet high quality refrigerated air dryer. It will work great for the average 60-80gallon single stage compressor and is capable of flowing 15cfm. It receives great reviews and is a reliable unit. It can be found on Amazon for $739.00 which is the cheapest I have been able to find it: Ingersoll Rand Refrigerated Air Dryer D25IN If you have a 2-stage compressor that is putting out more than 15cfm, then this is the next model up and it is capable of flowing 25cfm: Ingersoll Rand Refrigerated Air Dryer D42IN. If you decide to use a refrigerated air dryer, it is advisable to put a filter before it to catch particles before they enter the dryer. The filters are explained right below. With a filter like the one linked to above, the bowl is clear so that you can see the water accumulating. When the bowl gets full, you must manually drain it with the little knob on the bottom. If you fail to drain it, the bowl water will start to feed right back into your air line, so don't forget to keep it drained. Note: Sometimes these water traps come attached to a regulator and an air tool oiler. The regulator is no problem, but make sure you absolutely do not put an oiler on the hose you will be using for sandblasting or powder coating. An oiler is meant to add a steady supply of oil for your air tools, if you currently have an oiler on your powder coating gun air line, remove it and replace the air hose with a clean one immediately. A desiccant air dryer may look very similar to a water trap like the one talked about above and the construction is very similar. The difference is that a desiccant air dryer is filled with tiny little beads that absorb water called desiccant beads. These beads chemically absorb water and alone, this item is great for dry air. However, the beads do eventually fill up with water and lose their effectiveness until they cannot absorb any more water at all. The beads are often color changing, they may start out as purple, and then change to pink once they are full. A neat little trick with these is that you can spread the beads out on a cookie sheet and bake them in the oven which will dry them back out again. When baking them, set the oven at around 250 to 300 degrees F and just remove the beads from the oven when they are their original color. Once they are dry, you can put them back into use. Desiccant beads are not cheap so this method will save you a lot of money. These beads will still eventually break down and need replacing eventually. These desiccant dryers work great if you intermittent tools like a powder coating gun. The beads should last a long time. However, for a sandblasting cabinet, that you could use for hours at a time, the beads will need baked/replaced much more frequently. It is best to use these as a final filter before the tool along with another water removing device beforehand that catches the bulk of the water. This will get you the longest use out of the beads. The standard in Desiccant Air dryers is the DeVilbiss QC3. It is used by auto body shops as a final filter before the paint gun. 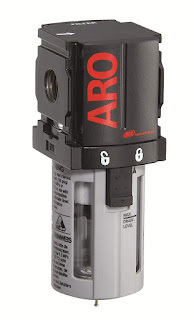 It also removes dirt particles down to .1 microns, removes oil, and it has a built in air regulator. A heat exchanger such as an Oil Cooler , transmission cooler, or automotive a/c condenser can be used to cool the compressed air followed by a water trap to catch the water. The most common placement of the heat exchanger when using this method is actually right after the air compressor pump and before the tank. Meaning the air is cooled and dry before it even enters the tank. You can then supplement the heat exchanger with a fan blowing across it. This has a couple of benefits, first is that your tank will remain much dryer inside so that reduces chances of the inside of the tank rusting. Also a nice side-effect is that your tank will be able to hold more air as the air. Colder air is denser, the denser the air going in to your tank, the more air you will actually have in your tank. 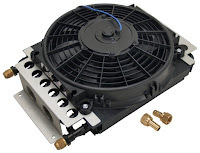 You can see a very detailed build thread of a guy using an oil cooler to cool off his compressed here in this thread: Garage Journal Air Compressor Aftercooler. 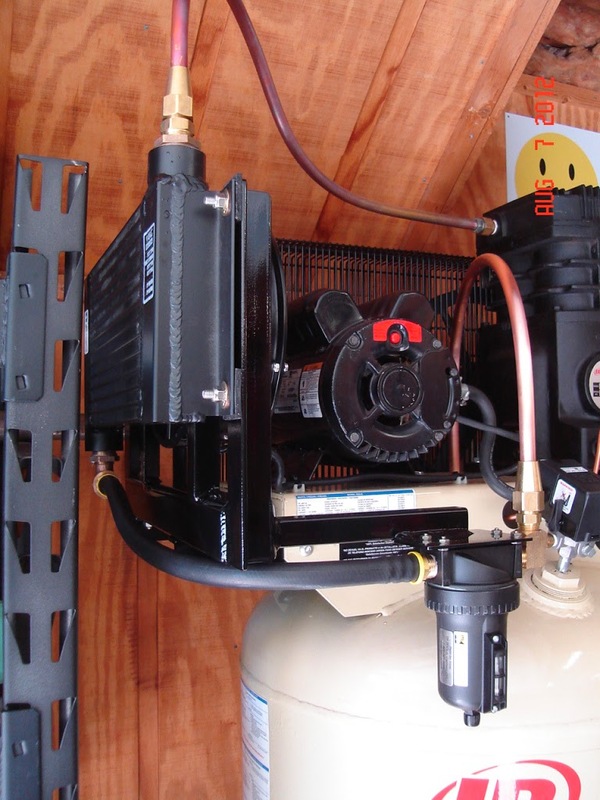 If you would like to go this route and position the cooler between the pump and the compressor, you will need to make your own copper lines coming from the pump to the cooler, and then from the cooler into the tank. Do not use rubber here as the air exiting the pump can be over 300 °F. Your air lines themselves and the way you plumb them can be used to remove water from your compressor. A long length of metal pipe such as copper or black iron will absorb a lot of heat from the air running through it which allows the water to drop out of suspension. Designing your piping system and comparisons of copper and iron pipe are covered in detail here: Plumbing your Air Compressor. 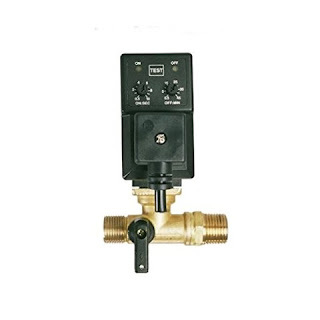 The water can then be trapped by a water trap or a T-Fitting and a Ball Valve. See the example below. Arranging your piping like the example above uses gravity to let the water fall down into the lower segment where it can be collected and removed while the air can continue on its path. When you open the ball valve, the collected water will drain out. This is called a "drip leg." You can use a series of these run up and down the wall to allow the air to cool as it moves through the piping. After each drip leg, the water is reduced more and more and you should set it up so by the time you drain the last drip leg, no water should come out. This method works well and some people use this as a stand-alone method to remove water from the air. This method is the cheapest of all the methods mentioned above but it only lasts until your ice melts. The idea is that you take a 50ft air hose coming out of your air compressor and coil it up in a bucket of ice water. The hose then immediately goes to a water trap . The ice water will cool the hose which will cool the air. After the air is cooled, and the water vapor turns into water droplets, the water trap is there to catch the water. This method does work but obviously it involves constantly replenishing the ice. An upgrade to this method is using a copper coil instead of an air hose. A rubber air hose is a very poor choice for heat transfer. It acts as insulator. 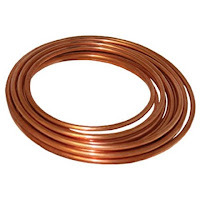 By using a copper coil, you can transfer much more of the heat into the ice water. To preserve the ice for longer periods of time, you can use a cooler in place of the bucket. You will need to drill an inlet and outlet hole in the cooler and then fill the gaps with some expanding foam to make a good seal. The cooler will stop the ice from melting for a longer period of time, or you can take it one step further and put a bucket of ice water in a mini-fridge. If you decide to use this method, the most important thing is keeping the loops of the coil horizontal and you want the loops to spiral in a downward pattern with the water trap being at the lowest point. This allows the water to drain downwards towards the water trap and it prevents water from pooling up inside of the coils. Regardless of any of the above methods that you decide to use to dry your air, you need to drain the air compressor tank frequently. There is a drain on the bottom of the air compressor tank that you will open slightly to let nasty water/oil stew drain out of and then close it once it is done draining. Do this every day that you use your air compressor. If you are using your air compressor for extended periods of time, drain it several times while you are using it. This will keep the tank free of rust and it is your very first line of defense against removing moisture from your air lines. If water is allowed to build up in the tank, over the years, the tank will rust internally making it weaker. I have seen a tank that exploded due to internal corrosion and it took out half of the garage, if anyone was present in the garage at the time, it could have been deadly. Unfortunately, draining the tank is a pain because the valve sits underneath your compressor. I picked up this Drain Extension Kit which extends the drain to a ball valve in a more accessible place. If you would like to automate this process, auto drains are available that will automatically drain the tank for you periodically using a timer. 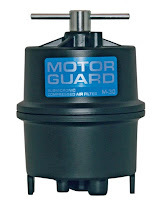 To remove any oil from your compressed air lines, Motor Guard Filter has been the choice for decades. It is also known as a toilet paper filter. People even used to use them in their cars back in the day in place of an oil filter. I would consider the Motor Guard filter to be a point of use filter. Meaning you use a quick-disconnect fitting on each side of it and only use it when you need the cleanest air possible, like when powder coating. I do not use it when sand blasting. The Motor Guard filter uses a cartridge that looks very much like a roll of toilet paper which is compressed between the top and bottom housing. The compression of the roll causes the layers to spread out slightly allowing some room in between each one. The air passes through the voids in the layers of paper and any oil or dirt particles will be trapped. A neat trick I have read about is to use actual rolls of toilet paper to replace the filter when it reaches the end of its life. Apparently, the toilet paper works almost as good as the Motor Guard replacement filters. I have yet to replace my cartridge but when it is too nasty to use any more I will try it out. When choosing the toilet paper, they say the cheaper, the better, meaning the single ply stuff that feels like sand paper. The standard series of Motorguard filters removes oil droplets but unfortunately will not remove oil in vapor form. For completely oil free air (<.01 PPM), the Motorguard MC-100 filter can be used. The MC-100 uses activated carbon to remove the vaporized oil from the air lines. 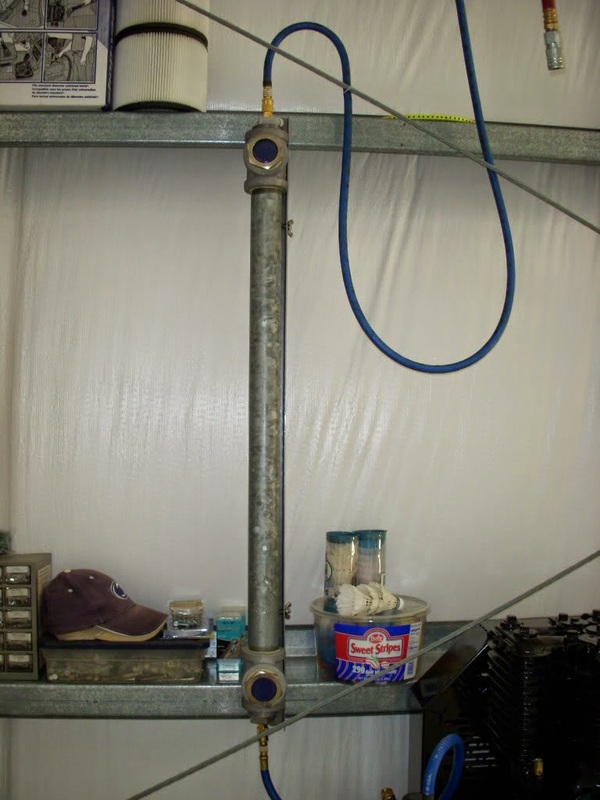 This level of oil removal is usually only reserved for spraying waterborne base paints, but if you want to be 100% certain that there will be no oil making it into your powder coat operation, this filter will handle it. I have now provided you with a bunch of different ways to remove any water or moisture from your air compressor. Depending on your budget and your DIY abilities, you can select which method or methods suits you best. All of the methods are effective and proven to work. Some of these options are expensive, but do not let that dissuade you from powder coating. If you are just getting started and want to try it out, stick an air hose in a bucket of ice and start coating. As you continue along, you will improve your equipment and see the need for cleaner air. These items are not just powder coating specific, if you ever want to use a paint gun, or a plasma cutter, you need air that is just as clean and dry. 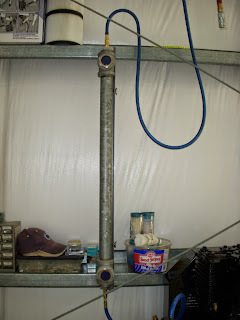 In the next article, I will be discuss How to Plumb your Air Compressor and what types of piping to use. I originally intended it to be included in this article, but this article is long enough as-is. However, make sure to check out the next article as plumbing your air compressor goes hand-in-hand with everything I mentioned above. As always, thanks for reading and if you enjoyed this article, don't forget to leave a comment or follow Powder Coating: The Complete Guide on any of our social media pages linked below. I'm glad you finally found it. I guess I should have wrote it sooner. Thanks for reading. MotorGuard actually sells a couple different filter systems. The M30, M60 and M45 and M100 kits do not remove oil vapors. The MC-100 Activated carbon filter is the only one that removes oil vapors. Thank you for pointing that out, I added the info about the MC-100 into the article. The method I made that really works and is cheap is the pipe method shown in the article, but I filled mine with glass rocks from Hobby Lobby that are used for aquariums and flower vases, marbles would work too but they cost more. The cold glass has a high thermal capacity and really cools the air down great. The pipe inlet is above the compressor tank so the water can return to the tank by gravity to be vented when the tank is blown down. The outlet is even higher of course, mine is near the ceiling. I paint cars with it and don't use any other filters. That sounds like a great idea, I have never seen that done before. If you are able to paint with it and no other filters, then it must work great. Thanks for the info. Can you explain in a little more detail how you constructed your method? In your first paragraph, you talked about how important it is to take out the contaminants of your compressed air. How long would it take for your system to break down if you don't ever clean your compressed air? We're definitely going to keep this in mind to make sure our system is running healthily. Not only do you need clean air to breath, but your compressed air system needs to have clean air as well to run better. Fantastic article by the way! Most ideal approach to dry compressed air is before you compress it.A refrigerant air dryer is most straightforward,almost support free, and bonehead evidence however lavish and you need to get one a size bigger in the event that you install it in the compressor inlet.For low first cost,I suggest brisk change DIY desiccant air dryers on the admission piping before the filter.You make three so you can have one in administration while another is prepared, and one in the toaster oven you have right by the compressor to recharge the desiccant for 8 hours at 250F.Install your air filter between the dryer and the compressor. Very efficiently written information. It will be beneficial to anybody who utilizes it, including me. Keep up the good work. When powder coating, how would you clean the equipment if it were to be left out in a dusty and dirty area. This is something that sure has me wanting to know because my father has put in my charge of coating the handrails of his house. Since he recently had his handrails installed he figured that I would be able to do all of them. I don't know how you plan on powder coating handrails that have already been installed as the finish will need to be baked in an oven but I usually handle clean up with denatured alcohol. You can pour it in the hoses with a funnel and then blow it through with compressed air. It will differ based on your compressor and the humidity where you live. However, I would recommend a minimum of 25 feet total. I have right around 30 feet of 1/2" copper in my garage and only 1 zig zag with a ball valve on the bottom. That then feeds into a water separator and I run my air lines from there. I haven't had any moisture issues since I switched to the copper lines and I live in Florida where there is always lots of humidity. What do you think about using a Tractor trailer Brake air dryer in line ? Excellent article. The first paragraph contains a link to How to Buy an Air Compressor, but it actually takes you to a page about Plumbing Your Air Compressor. To help future readers you may want to correct the link.